The Serengeti-Mara region (Tanzania-Kenya) has undergone considerable changes in vegetation, fauna, and human populations over the past century. In the early 1880s, a severe drought killed large numbers of livestock kept by the Maasai. Soon, rinderpest entered the African continent from Asia and swept through the Serengeti-Mara region. Populations of both domestic ungulates and wildlife species, including giraffe, buffalo, and wildebeest quickly succumbed to this exotic viral disease. The Maasai herdsmen were further impoverished. Ivory hunters arrived on this scene by the late nineteenth century, and aided by some of the destitute Maasai, almost wiped out the elephants there. The natural vegetation of the Serengeti-Mara region was, at this time, grassland and lightly wooded savanna. Beginning around the turn of the twentieth century, the woody vegetation grew profusely over this region. Croton thickets and various species of Acacia became the conspicuous features of the landscape by the middle of the century. Proliferation of tsetse flies, which caused the parasitic blood disease trypanosomiasis in cattle and sleeping sickness in humans, also kept the Maasai away. lands, attracting grazing animals. The stage had been set for a dramatic decline in woodlands. Fire frequencies and extent increased, with two or even three fires in some years. The fires not only cleared the bush or suppressed regeneration, but also, at their peak, killed the larger trees. The increasing elephant population and their use of woody vegetation through breaking of branches or stripping bark made the trees more vulnerable to fire. Elephants also directly caused the death of trees. The various studies on decline of woodlands in the Serengeti also spurred efforts to model the dynamics of the vegetation in relation to fire and mammalian herbivores. Mike Norton-Griffiths took a landscape approach to modeling the changes in the Serengeti. He began by studying patterns of changes in woodland density. He based the study on aerial photographs at different scales and coverage of the park between 1958 and 1972, annual extent of fire during 1963-1972, densities of 13 species of mammals, including elephants, on a seasonal basis between August 1969 and July 1972, and data on climate across the park. There were considerable spatial differences in the loss of woodlands; the higher rainfall regions of the north ("dry subhumid woodlands") lost 26% of their cover density during 1962-1972 compared to only 7% loss in the central semiarid acacia woodlands. A statistical multiple regression analysis using square grids of 100 km2 and six variables relating to climate, fire, and elephant abundance showed that, in the semiarid central region, the two elephant indices (wet and dry season densities), followed by fire, best explained woodland change. For the subhumid north, where woodland decline was steeper, fire was the most important factor explaining this change. 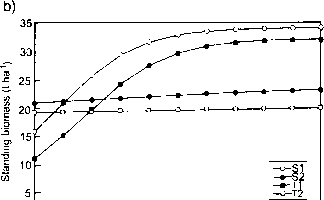 Norton-Griffiths then simulated, over a 30-year period, the response of the size structure of tree populations to various mortality and growth-retarding influences, such as fire and browsing by elephant and giraffe. No provision was made for seedling establishment because of lack of data. Although a "pessimistic" scenario, this was possibly not important over the short timescale of the simulation. The model suggested that the woodlands were capable of stabilizing, under the conditions prevailing in 1972, provided that they were protected from fire even if elephants increased utilization of the woody vegetation, but not if giraffe increased browsing. Over the longer term, the dynamics of the Serengeti would also be influenced by the production of grasses and their offtake by herbivores such as buffalo and wildebeest. Norton-Griffiths thus felt it feasible that the Serengeti could oscillate between more-woodland and more-grassland phases, mediated by fire and grazers. The addition of browsers or animals such as elephants that can alternate between grazing and browsing introduces levels of complexity not easily tractable. Robin Pellew constructed a more detailed model that specifically simulated the Acacia tortilis woodlands of the Seronera region of the Serengeti. The variables in the model were much the same as previously—fire, elephant, and giraffe—but with seedling input being proportional to the number of mature trees. Projecting ahead from the year 1978, the model showed that the mature tree population would decline when burning frequency exceeded once in about 5-6 years. While reducing elephant numbers would have a short-term benefit in arresting tree decline, a more significant longer-term benefit accrued through reducing browsing pressure from giraffe. The prevalent low elephant densities and high giraffe densities in the Serengeti resulted in a system that oscillated between mature canopy and regeneration-grassland phases. Pellew concluded that, rather than culling elephants, the reduction of giraffe numbers and protection from fire were more likely to help in achieving management goals in the Serengeti. A very different conclusion, however, was reached by yet another modeling exercise. During 1960-1980, the Serengeti-Mara habitat changed dramatically back to grassland. Wildebeest increased fivefold during this period and removed much of the grass. The lower intensity of fires, however, did not result in recovery of the woodlands. Holly Dublin, along with A.R.E. Sinclair and J. McGlade, modeled the woodland-fire-elephant-wildebeest interactions in the Serengeti-Mara. Their model tracked the fate of trees in relation to burning rate, browsing by elephants and resident antelopes, and trampling of seedlings by wildebeest. Burning rate was assumed to be related to fuel loads and density of humans in the region. Fire only affected trees less than 3 m high, as in previous models. Elephant browsing on trees was proportional to elephant density, not only affecting trees above 1 m in height during the 1960s, but also affecting seedlings during the 1980s, when larger plants had disappeared. Small, browsing antelopes such as impala, dikdik, and Grant's gazelle affected trees less than 1 m only. Similarly, wildebeest damage to trees through trampling was confined to plants less than 1 m.
The model was based on several constants and variables derived from field research by various workers. It was run by varying individual factors such as fire, elephants, wildebeest, or browsing antelopes while holding other factors constant. The synergistic effects of combinations of these factors were also explored. Aerial photographs of the Serengeti-Mara region since 1950 provided the data on actual status of woodland and grassland in the past and rates of change. Several interesting results emerged from the simulations (fig. 6.9). The observed rates of woodland decline during the 1960s could clearly not be attributed to even the maximum possible rates of browsing by elephants and antelopes. On the other hand, minimal burning rates recorded in this region over the same period could explain the decline in woodlands. This was largely consistent with the hypothesis of Norton-Griffiths that fire was the primary cause of woodland decline in the Serengeti-Mara. 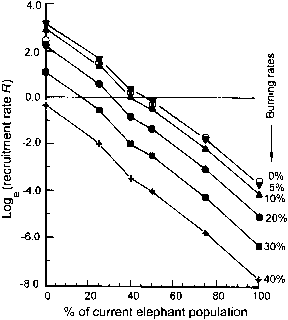 The simulations showed, however, that the combined effect of fire and elephant browsing best explained the observed rate of habitat change in the 1960s. region. Holly Dublin's observations of elephant feeding revealed an aspect that had been largely overlooked earlier; when the larger trees had disappeared, elephants began pulling out seedlings and eating them. This behavior was obvious only to a careful observer; to a casual observer, it seemed that elephants were just eating grass or other herbs. When elephant feeding on seedlings was plugged into the model along with fire and wildebeest variables, it was clear that the grassland could not revert to woodland. This was consistent with the observations in the Mara during the 1980s. In the northern Serengeti, bordering the Mara there were signs of woodland recovery. Anthony Sinclair used photographs of identifiable areas of the Serengeti taken between 1926 and 1933 and compared these with his own "photopoints" monitored since 1980. He also used available aerial photographs for looking at changes in woodlands, particularly those of Acacia clavigera. Since the 1970s, there was clear evidence of woodland regeneration, a process that continued through the 1980s. The explanation for this contrast with the Mara was simple. There had been a marked change in numbers and distribution of elephants. Poaching had removed up to 80% of elephants in the Ser-engeti, while the rest had probably moved into the Mara, which now had a high elephant density year round. Released from elephant browsing, the woodlands recovered in the northern Serengeti. They could not do so in the Mara. Caughley's hypothesis assumed that seedlings were immune to browsing by elephants, a condition not met in the Mara. A major outcome of this work was the "multiple stable states" hypothesis. The savanna woodlands of Africa could oscillate between two equilibria or stable states, one a woodland with few elephants and the other a grassland with many elephants. The elephants by themselves were unable to change a woodland to grassland—an external perturbation such as fire was needed for this to occur. Once a grassland was formed, however, elephants on their own could hold it in this state. 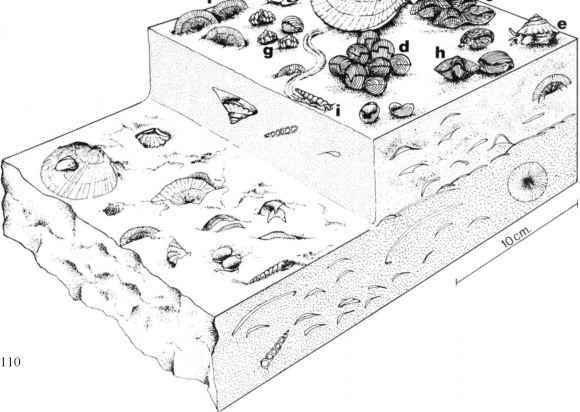 The concept of different stable states in ecosystems had been proposed earlier on theoretical grounds by several people, including C. S. Holling (1973) and Robert May (1977). The Serengeti-Mara example was one of the first direct tests of the hypothesis. There were interesting implications for the management of elephants. If the goal of management was to bring back the woodlands in the Mara, this would be possible only if burning rates were held at less than 10% per year and the elephant population was reduced to less than 40% of the current (1990) levels, both very unlikely in the present context. Thus, the Mara seemed to be locked into its present grassland state. The future of vegetation in the Serengeti-Mara obviously depends on the outcome of several individual and interacting factors. At some future time, could the Mara elephants move back into the northern Serengeti, perhaps after discovering its recovered woodlands, a rich source of browse? If wildebeest populations continue to remain at high densities in the Mara, could they keep the grass sufficiently low such that the burning rate is negligible? Could there then be a resurgence of woodlands in the Mara? The important point that emerges from the recent history of the Serengeti-Mara ecosystem, documented by Holly Dublin, is that the concept of "climax" vegetation or community that pervades ecological thinking has no place in such a system. Even if no significant human interference is indicated, it is conceivable that the system could naturally oscillate between different states. Whatever the actual characteristics of elephant-vegetation dynamics in the various kinds of habitats in which elephants are found today, the credit should go to Graeme Caughley for a radical departure in thinking on this subject. 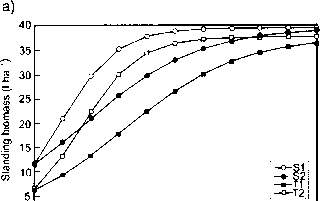 The stable limit cycles with smooth trajectories he envisaged may never occur in an elephant-tree system. Chance fluctuations in elephant births and deaths (demographic stochasticity) and environmental factors such as climate (environmental stochasticity) could cause both elephant populations and woodlands to oscillate rather erratically. Indeed, the development of stochastic models of elephant-vegetation dynamics, as has been done with elephant demography (chapter 7), would be a significant step forward in understanding semiarid ecosystems.